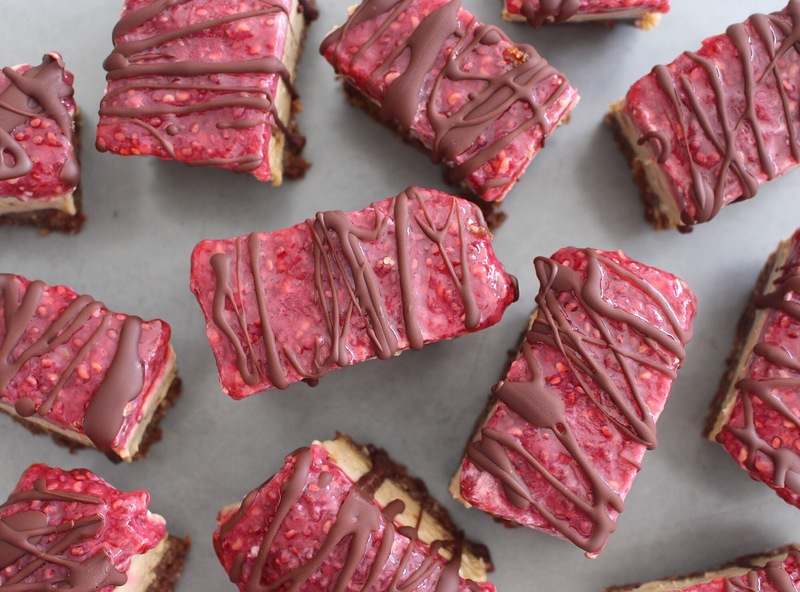 It really is such a yummy combo – a perfectly balanced marriage of salty and sweet, creamy and tangy, nutty and fruity – so I was really inspired to come up with a dessert that showcases these amazing flavours (in case you were wondering I’ve already got breakfast covered with our PB&J pancakes). Something tells me this won’t be my last PB&J recipe either as I am definitely a little bit obsessed! 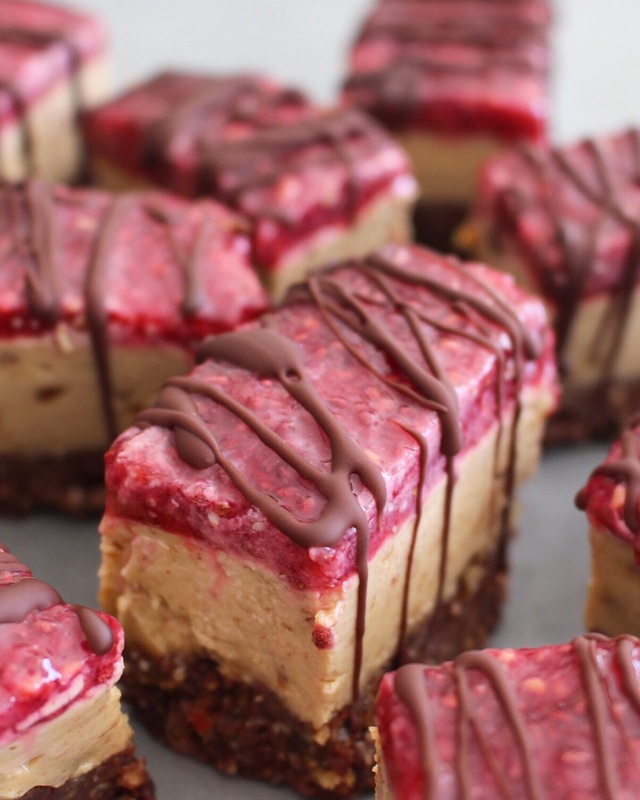 These slices are just heavenly though and I defy anyone not to like them – they’ve got a gorgeous crumbly, chocolatey base, topped with a creamy and sweet peanut butter cheesecake layer and the loveliest raspberry jam on top. And as if that weren’t enough deliciousness for one mouthful, I’ve added a drizzle of raw chocolate to decorate which not only makes them look super pretty but just adds to their general amazingness. To make the base, simply combine the ingredients in a food processor and whizz for a couple of minutes until the ingredients start to form a sticky mass. If it’s too crumbly still, add in more water one tablespoon at a time and keep whizzing until you get the required consistency. Once you have this, spoon the mixture evenly into a lined tin or mould and press down so that it’s all flat and compact. For the peanut butter layer, pop the ingredients in a food processor or high speed blender and blend for about one minute until a smooth, creamy and thick liquid forms. Pour this on top of the base and even it out with a spoon. Place in the freezer for an hour or so to set. Once this has set, simply spoon the raspberry jam on top and again even it out with a spoon and place in the freezer for at least an hour to set. Once this is done, remove from the freezer and cut into slices with a sharp knife. If you’re adding the melted chocolate on top, now’s the time to get drizzling so get your melted chocolate ready and drizzle away! Store the slices in the freezer and remove 15 minutes or so before eating.